Looking For The Best Time To Book a Flight from the US? 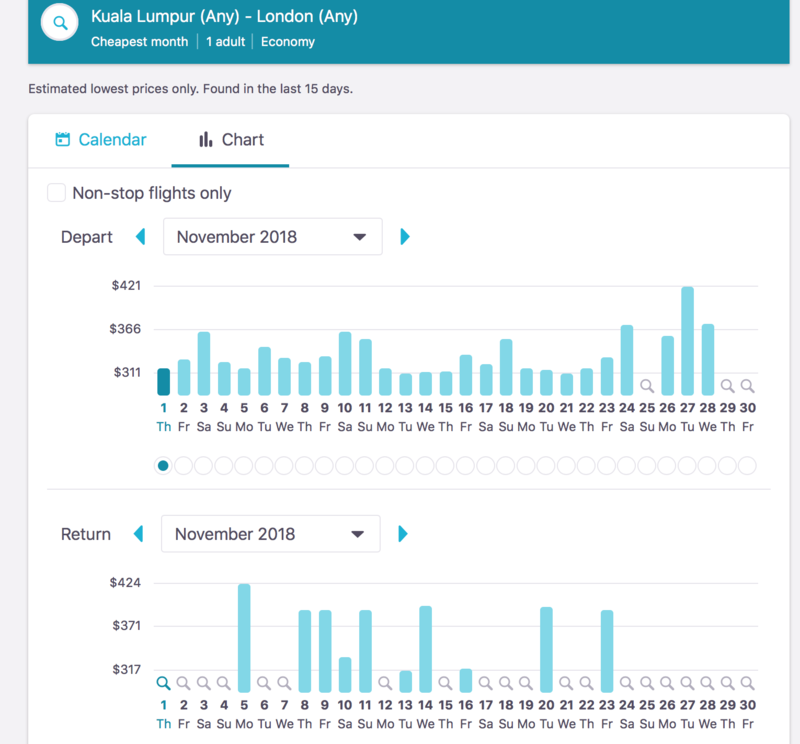 Skyscanner analyzes last year's booking data to predict the best time to book a flight in 2019. 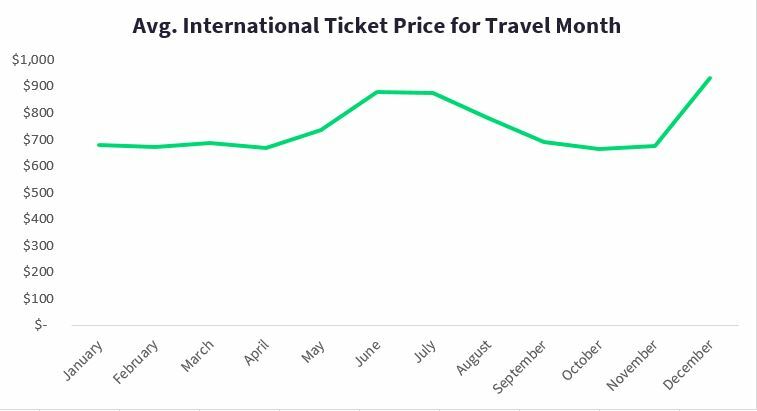 Skyscanner has analyzed historic data to determine that January 2019 will be the cheapest month to book flights in 2019. 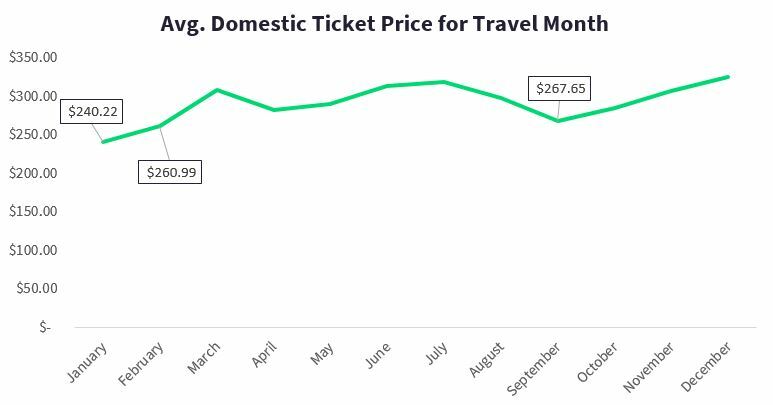 If last year is an indication of what to expect in 2019, then according to the graph, January will likely be the cheapest month to book flights for 2019 with an avg. round-trip flight price of about $500. (followed by August and February). When is the best time to book flights from the United States in 2019? Book on Tuesdays for domestic flights & Wednesday for international flights. When is the cheapest day to book flights? Grab your domestic flights on Tuesdays and international flights on Wednesday for the cheapest day to book a flight. Want to play it safe? 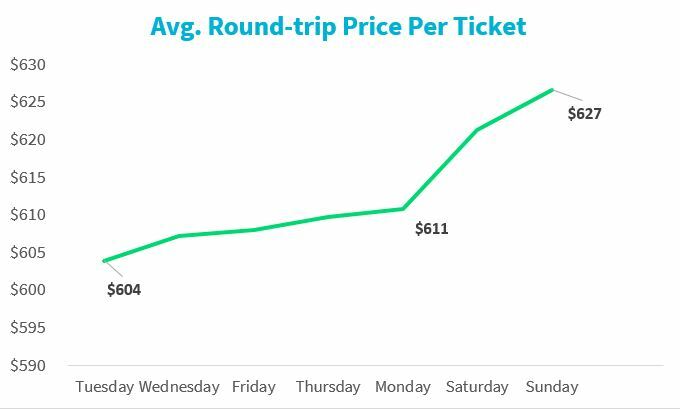 When looking at all destinations around the world, Tuesday on average had the cheapest prices at $603 round-trip in 2018. When is the best time of the day to book a flight? 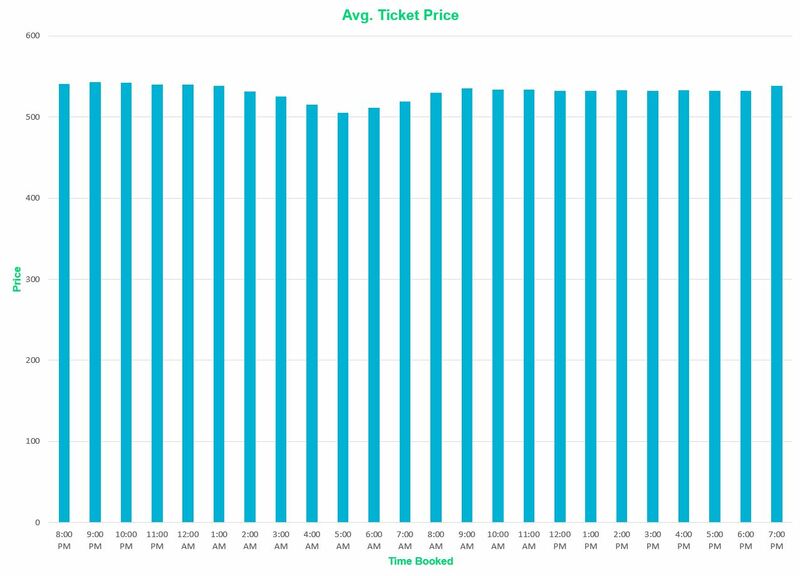 Skyscanner suggests that 5am on a Tuesday is the cheapest time of the day to book your flights in 2019 based on historical data. See the chart below for fluctuations in price depending on what time of the day you book a flight. When is the Cheapest Month to Fly in 2019? Flexible on your travel dates? Historical data from 2018 suggests that for domestic trips, you should travel in January, followed by February & September for the cheapest flight prices. For international destinations, we recommend flying in October when average flight prices are $665 compared to December when they hike up to $931 round-trip. Other cheaper months include April where prices average at $668 and February with prices averaging $673 round-trip. 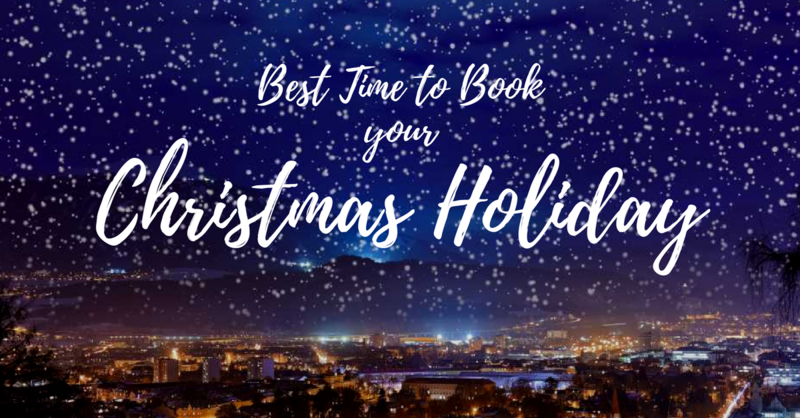 Whether you’re traveling home for the holidays or going someplace exotic, Skyscanner has discovered the best time to book Christmas flights. 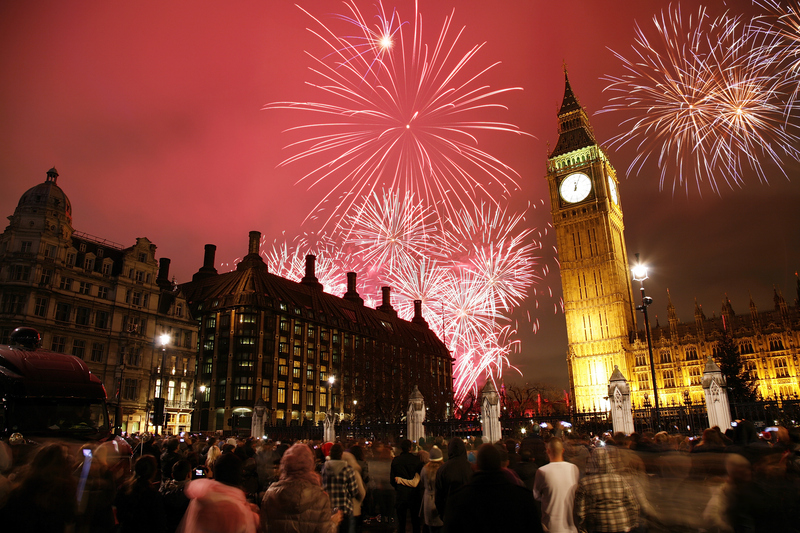 FRing in the new year wherever you want by knowing the best time to book New Year’s flights to celebrate for less. And what better way to start the year off than by saving some cash on your flight? Family and turkey should be what you want for Thanksgiving, not an expensive flight home. 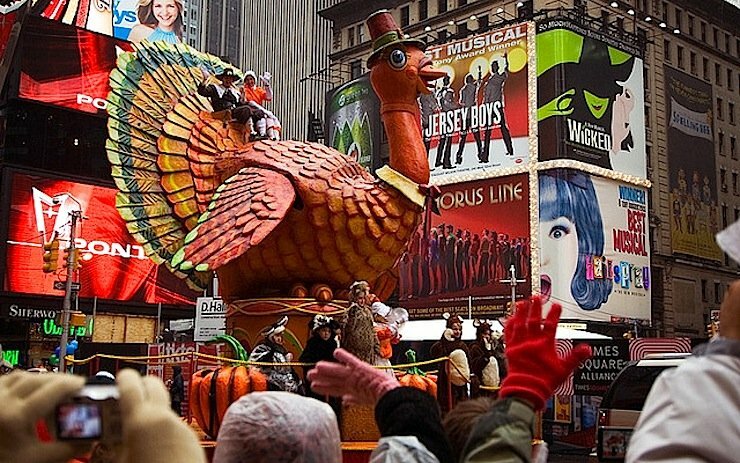 Make sure you know the best time to buy Thanksgiving flights with our help. Want to get away for a quick Labor Day weekend getaway? 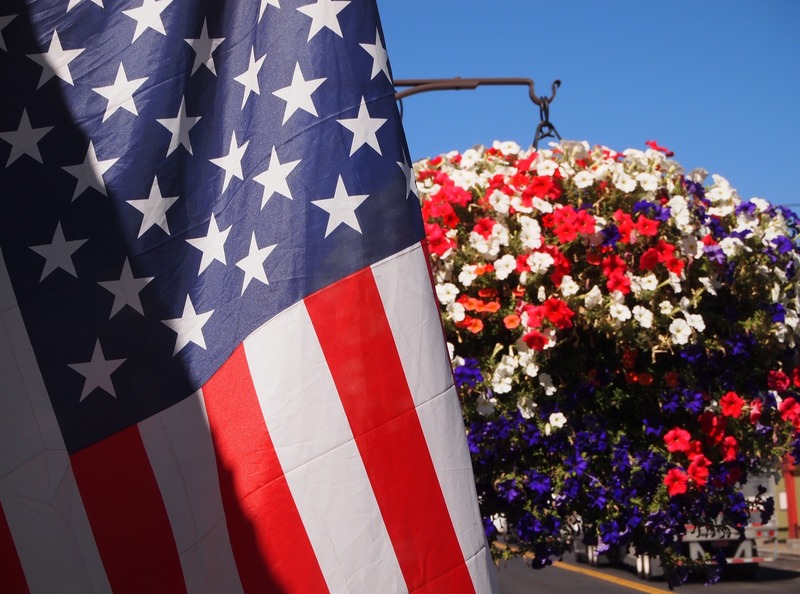 Find the best time to book Labor day flights & top deals. 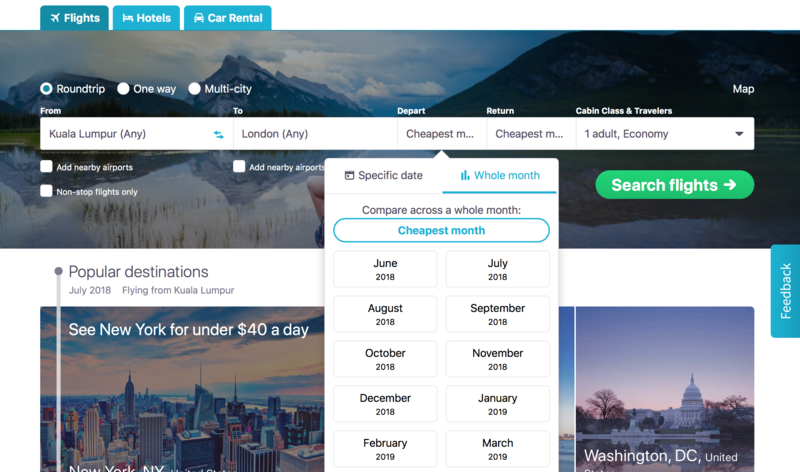 The Cheapest Month Search is another feature that can really help you find cheap airline tickets to your chosen destination. On our flight search page, enter the airport you will be flying from, then enter the arrival airport. Instead of entering a specific date of travel, you have the option of either searching for the prices of airline tickets in the cheapest month of the year or requesting prices to compare across a whole month. Looking at specific dates will let you pick the best time to fly. Viewing all the prices across a whole month in graph form will allow you to spot for price trends. A little research with Skyscanner will let you save quite a lot of money! Travel trends and information from previous years can give clues as to when plane tickets will be available at the lowest prices. Be sure that you are ready for the cheapest days to fly by setting up a free Skyscanner Price Alert. Never miss out on low-priced flight deals ever again by using the Skyscanner Price Alerts Feature. You can save your favorite itineraries and receive alerts in case the price changes. That way, you can book travel deal as soon as they appear on our site or app. It helps you stay on top of your flight price. 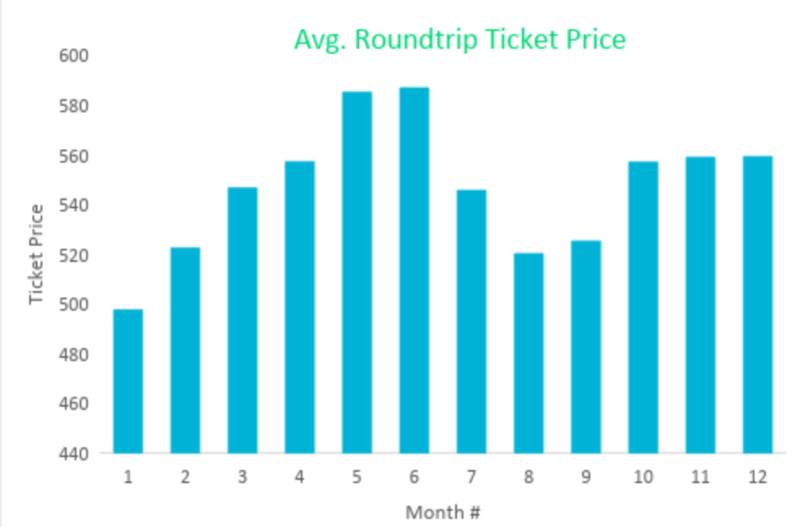 You’re informed on when your flight price is going up and down. It’s less work for you, just wait for the price to drop and book! 2. What is a Price Alert? It’s a flight price tracker for any route you choose. When the price changes, you’ll get notified via email if the price went up or down. It’s free, so you can unsubscribe at any time. It’s the best way to find cheap flights, fast. 3. How do I set up a price alert on my computer? 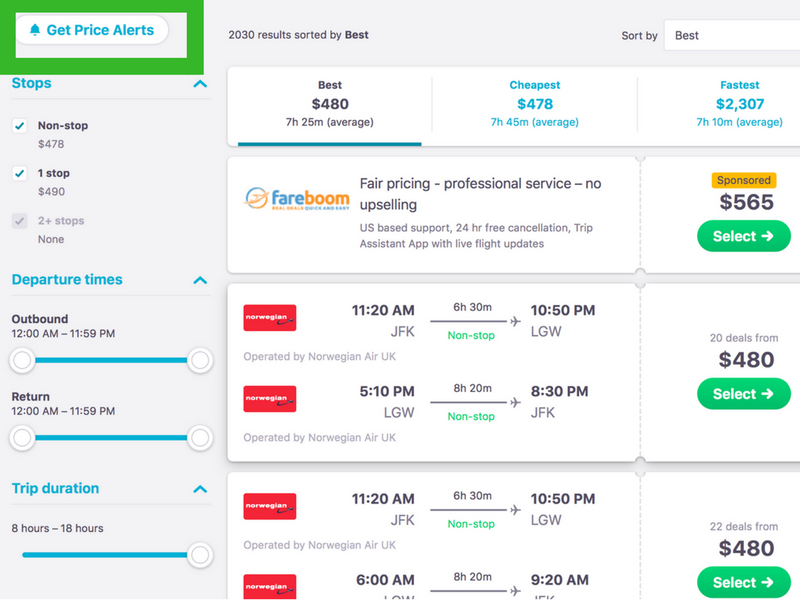 To find the best price for your flight, conduct a search for flights on Skyscanner, then click on the “Get price alerts” button – if you’re already logged in then it will automatically send the price alerts to your email. Not logged in? No problem, you can either create an account with us or just add your email address. 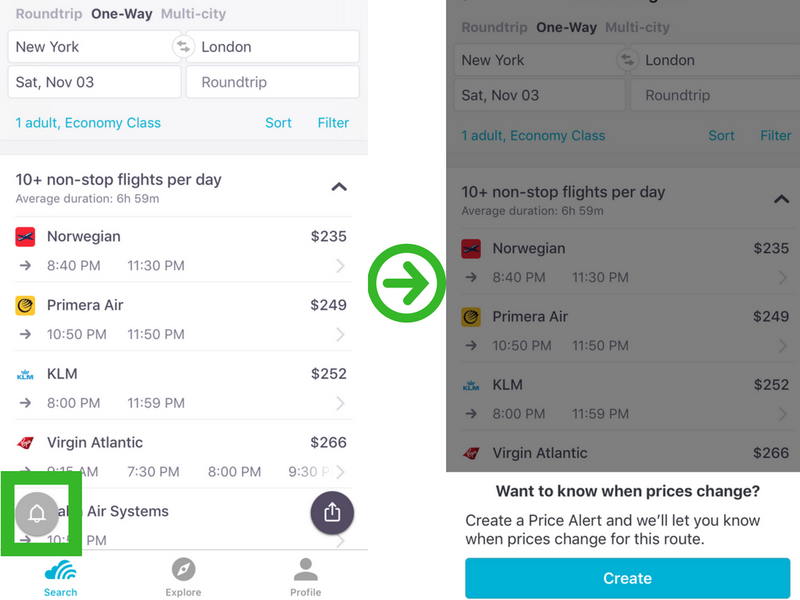 Skyscanner will then track the price of this search and each time your selected flight price changes, we’ll automatically send an email to you that shows the increase or decrease on plane tickets. Just remember that you must use the exact date and airports to set up a Price Alert. 4. How do I set up a price alert on my app? When you download the Skyscanner app, you also have the option of tracking the price of your flight through your mobile device. Simply make a flight search on the app and within the results screen, select the bell icon on the bottom left corner of your screen. You will then be prompted to login or create an account in order to receive price alert notifications when the price of your flight rises or falls. You will be able to track the flight of your choice and book right when the price drops! Skyscanner Hotel Search helps you find the best hotel deal by comparing prices, reviews, location, amenities and more. Search, compare and save today. Such a simple way to get the greatest deals on the internet! I love you Skyscanner. I always get a great price, thank you!